Do you know this person? • He eats cereal out of a large mixing bowl. • Her bedroom looks like a garbage dump . . . on a good day. • If there were an Academy Award for eye-rolling, he’d win. • She changes outfits three times before breakfast... Congratulations! You have a teenager in your home. Life will never quite be the same again (of course, you already know that). But it can be better than you’ve ever dreamed. In fact, you’re just five days away from your teenager asking, “What can I do to help?” Guaranteed! With his signature wit and commonsense psychology, internationally recognized family expert and New York Times bestselling author Dr. Kevin Leman will help you: • gain respect—even admiration—from your teenager • establish healthy boundaries and workable guidelines • communicate with the “whatever” generation • turn selfish behavior around • navigate the critical years with confidence • pack your teenager’s bags with what he or she needs for life now and in the future • become the major difference-maker in your teenager’s life. 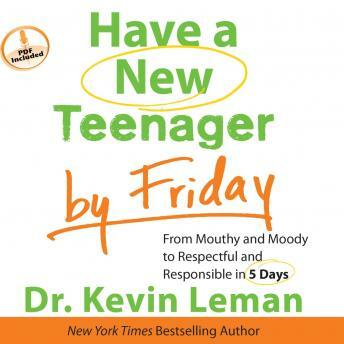 With Dr. Leman’s instinct and insight, plus an index with gutsy advice on 75 hot-button issues that keep parents up at night, Have a New Teenager by Friday will help you get real results—real fast. Awesome book! practical and funny. great real life tips you can use with your teen today!